Who has not dreamed of going around the world without constraints and especially without expenses? 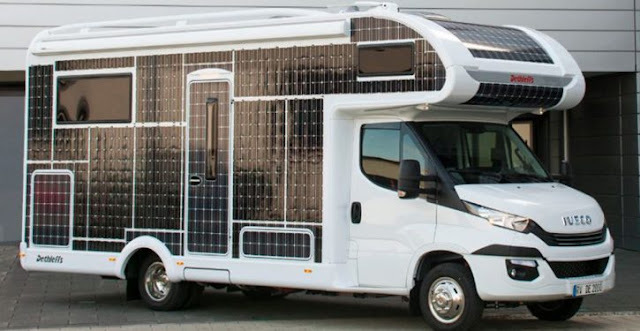 The Dethleffs motorhome company is about to fulfill the dream of thousands of people by creating the first prototype electric caravan that could see the light of day by 2024 as reported by our fellow Greenmatters. Planning a trip usually requires a budget, choosing a destination, finding accommodation, dates that match ... finally you'll understand, a keen sense of organization. And besides logistical considerations, traveling is above all a factor of personal fulfillment, well-being and relaxation. 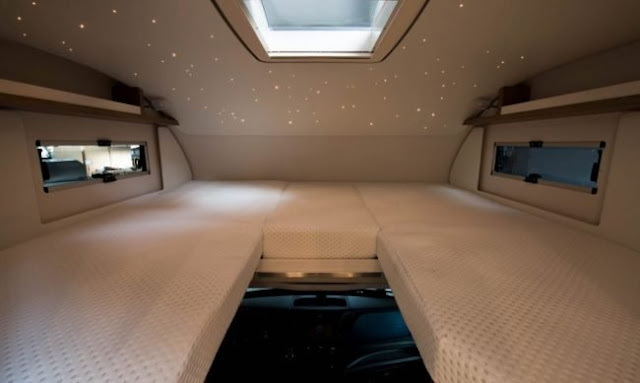 At the origin of the first caravans, the German brand Dethleffs is based on principles of comfort and innovation to offer its customers a unique experience. As their description testifies on the site of the group, it is in a spirit of family that its founder Arist Dethleffs creates in 1931 the first "car to live" which will allow to travel in the company of his relatives in a comfortable and accessible way. Eager to promote a socially responsible image, Dethleffs is now moving into the field of solar powered vehicles, and is creating the first ever electric motorhome based on the Iveco Daily model, a zero-emission electric-powered vehicle. Innovative and ecological, this model revolutionizes the notion of camping as we know it. "At home, it is the transport that pollutes the air the most. According to data from the European Environment Agency, engines are responsible for 33.2% of French CO2. And more than half of these emissions come from private vehicles (17% of the national total) "
In a shocking documentary on global warming, Al Gore reveals, as the title of his production indicates, an inconvenient truth. It calls for collective responsibility to face the environmental challenges that lie ahead and unveils a topic that many are unwilling to see, namely excessive emissions of carbon dioxide that slowly but surely destroy our planet and our health. Designed by Dethleffs, this ultra-modern design vehicle is a first in the world of motorhomes. 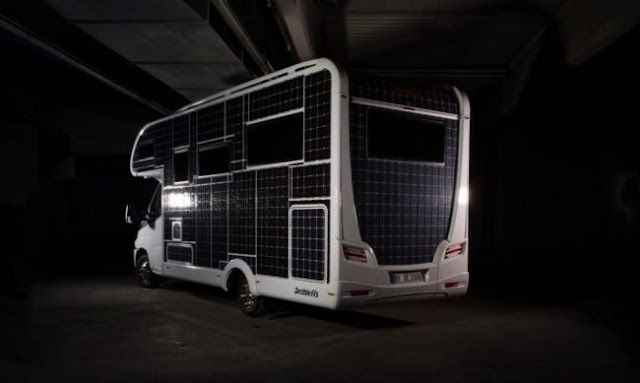 Equipped with solar panels spread over an area of ​​31m ² at the roof and sides, it has up to 3000 watts of energy. In addition, its fully recyclable sodium chloride nickel battery can be recharged up to 1500 times, which equates to a distance of 250,000km. Installed inside this modern caravan, it gives more autonomy to the driver by delivering it from the stress of charging stations. Another incredible feature of this vehicle: it is a wheel house at the forefront of technology! 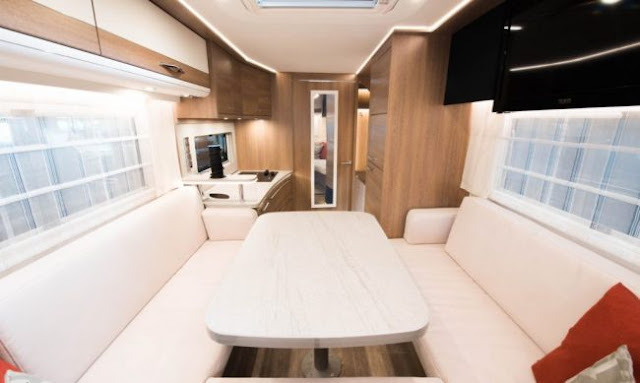 Equipped with a driver assistance system, smart windows and a heater, this e-home, as the manufacturers call it, allows you to maintain the comfort of your home while going to the discovering new horizons. 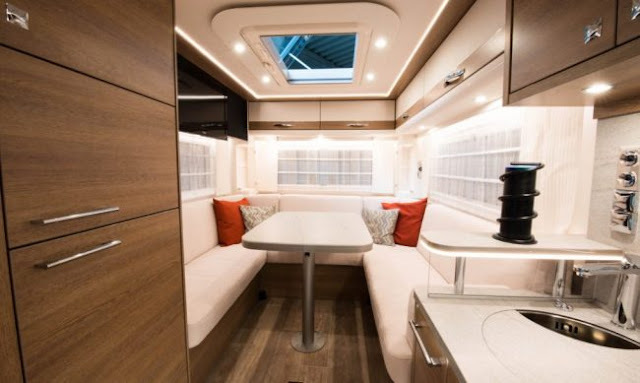 It is also this last point which jumps in the eyes of the lovers of the campsite during the presentation of the prototype at the caravan show in Düsseldorf. "Heating consumes a lot of energy, so we had to find a solution that would bring heat and save money. To this end, we used latent heat storage plates integrated in several parts of the camper. When the temperature exceeds 26 degrees, they store energy during the day to release it at night when temperatures are lower. It is therefore a prototype with eco-responsible functions, which makes you want to travel with family around the world, in peace!